Flying over Los Angeles in 1964, a trip that would initiate a life-long emotional and artistic relationship with the city, David Hockney was immediately struck by the endless specks of blue that dotted the land below. Unbeknownst to him and his Bradford upbringing, private swimming pools were commonplace in LA, a standard social space that Hockney would adopt as a recurring motif for many of his major works throughout the 1960s and 70s. Among his best known is his Portrait of an Artist (Pool with Two Figures), painted in 1972 and, as of last week, the record holder for the most expensive painting sold at auction by a living artist ($90.3m), comfortably exceeding the previous record of $58.4m set by Jeff Koons. Like much of Hockney's work, the composition of ‘Portrait of an Artist (Pool with Two Figures)’ is simply rendered and pleasing to the eye; dominated by cool blue and verdant green, the painting is as Instagram-friendly as your most recent jaunt to the Soho House rooftop pool. 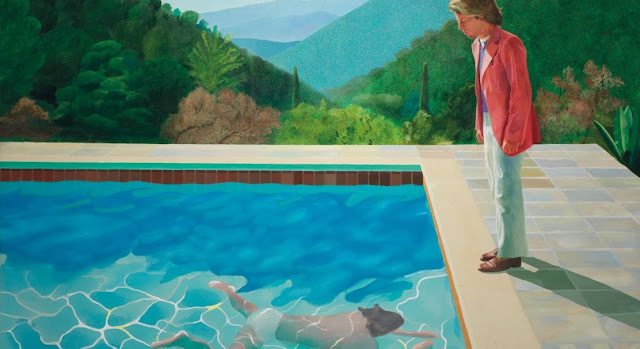 The painting depicts American artist and model Peter Schlesinger—a favorite subject and onetime lover of Hockney’s—watching an underwear-clad figure struggle underwater with seemingly no interest, hinting at a form of glamorous, essentially Southern Californian alienation that often seems to thrum beneath those obnoxious selfies at the pink Paul Smith wall in West Hollywood. It is the story behind the work however that makes this one of Hockey’s most captivating paintings. It began, as so many great things do, by chance. After seeing two different photographs serendipitously overlapped on the floor of his studio, one of a swimming figure, limbs distorted as he swam underwater and the other of a boy staring intently at the ground, the proposition of painting two figures in markedly different styles compelled Hockney to paint. Months passed, and Hockey continued to modify, tweak and rework the painting until he ultimately destroyed it. 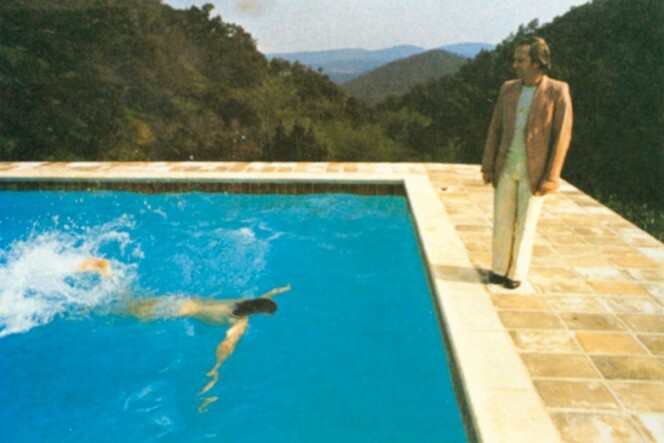 It was only in the run-up to his exhibition at New York’s André Emmerich Gallery in 1972, that Hockney decided to revisit the concept with a trip to Tony Richardson’s swimming pool in Le Nid du Duc, Saint-Tropez. There, his assistant Mo McDermott and friend posed for hundreds of photographs at the idyllic villa, re-creating the same composition that had thwarted Hockney’s creative efforts months previously. Back in his London studio, he worked uninterrupted on the painting for two weeks, substituting the pool-side figure with images taken of his former lover, American artist Peter Schleisinger, wearing the same pink jacket as in the original composition, stood in Kensington Gardens.